Best approach in today’s date is 'customize new technology with detailed analysis to make it highly efficient' in both drug discovery and enzyme biosensor industry. Several drug analogues are chosen and/or designed to inhibit specific enzymes in drug discovery. However, detoxification or reduced toxic effect of many antitoxins is also accomplished mainly due to their enzyme inhibitory action. Goldstein Research analyst forecast the Enzyme Inhibitors Market size is set to reach USD 150 billion by 2024, at a CAGR of 4.1% over the forecast years. The report covers the present ground scenario and the future growth prospects of the Enzyme Inhibitors Market for 2016-2024 along with its penetration in all the verticals and the ongoing research activities. We calculated the market size and revenue share on the basis of revenue generated from major players across the globe. On the basis of type, proton pump inhibitors are the leading segment of global enzyme inhibitor market owing to increase in gastroesophageal reflux treatments followed by protease inhibitors in HIV medications. While kinase & aromatase inhibitors are anticipated to witness lucrative growth over the forecast years owing to their application in tumorous cells. Enzyme Inhibitors Market Outlook 2016-2024, has been prepared based on an in-depth market analysis from industry experts. The report covers the competitive landscape and current position of major players in the global Enzyme Inhibitors market. The report also includes porter’s five force model, SWOT analysis, company profiling, business strategies of market players and their business models. Global Enzyme Inhibitors market report also recognizes value chain analysis to understand the cost differentiation to provide competitive advantage to the existing and new entry players. Our global Enzyme Inhibitors market report comprises of the following companies as the key players: AstraZeneca, Merck and Co. Inc., Novartis AG, Pfizer Inc., Ranbaxy Laboratories Ltd, Roche-Genentech Holding Ltd., and Takeda Pharmaceuticals. Other high-flying vendors in the market are: Abbott Laboratories Inc., Bayer AG, and Johnson and Johnson Ltd. According to the report, major driving factor for enzyme Inhibitors market is that in search of economic, efficient and practical enzyme platforms to test enzyme inhibitors, new user-friendly immobilized enzyme technology is available now days. It is based on principle that an enzyme molecule is contained within confined space for the purpose of retaining and re-using enzyme on solid medium in processing system or equipment. There are many advantages of immobilized enzymes and methods of immobilization such as low cost, suitability of reusable model system in membrane-bound enzymes in cell. Further, the report states that the major challenge is most of times, basic presumptions do not hold true in enzyme reactors and addition of new factors further complicates the calculation of reactor outcome. Most of the times, computer based kinetic calculations average out outcome as less realistic with more chances of variants. Other major challenge is that each time enzyme reactor outcome depends on individual inhibitor and individual enzyme reactor at different times. It is less reproducible 34 Enzyme Inhibition and bio-applications and unpredictable because of synergy, interplay of known and unknown physical, physiological, biological, molecular factors affecting reaction kinetics. 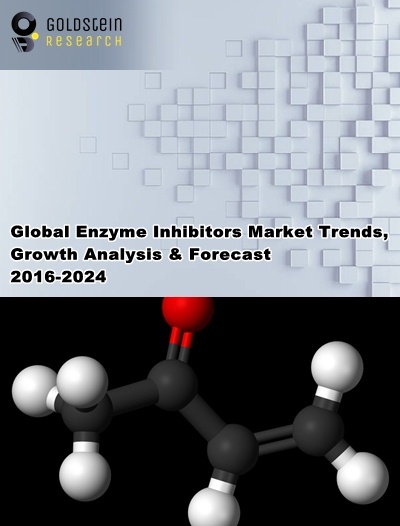 Based on geography, North America and Europe lead the enzyme inhibitors market with the market share of 70% in 2016 due to rising incidence of enzyme-based diseases and increasing research and development activities. Countries like US, Germany, Russia and UK are experiencing the market growth for enzyme inhibitors because of better availability of medical facilities, diagnosis rate for the diseases, infrastructure, awareness and available treatment options. However, APAC is the most potential market for enzyme inhibitors due to the existence of large patient pool, enhancing healthcare infrastructure in developing nations such as India, China, and South Korea. What is the revenue of Enzyme Inhibitors in 2015-16 and what would be the expected demand over the forecast period?